Join us at our 9th annual Paws for the Cure® dog walk and fall festival featuring a one-mile walk through scenic Hartwood Acres. We will have lots of things to see and do for our guests of all ages, even if you don't have a dog! All proceeds benefit Komen Pittsburgh. CLICK THE APPROPRIATE BUTTON TO THE RIGHT OF THIS PAGE TO GET STARTED! DON'T FORGET: VISIT YOUR PERSONAL FUNDRAISING PAGE! Already registered and would like to send emails out to friends and family members asking them to join your or donation on your behalf? Click here! > Shirts are only available for pick-up the day of the event. > Shirts are guaranteed to the first 500 registered participants. > We will do our best to accommodate sizes but cannot guarantee all requests. This event will occur rain or shine. We reserve the right to cancel in extreme circumstances. In that event, there will not be refunds. Your entry fee will be used as a donation to Komen Pittsburgh. Thank you! The deadline to register online is Wednesday, October 4, 2017. In person registration will be open beginning at 9AM on October 8, 2017. Check back soon as we announce our contests and activities! Calling all small business owners, consultants, crafters, and the like! 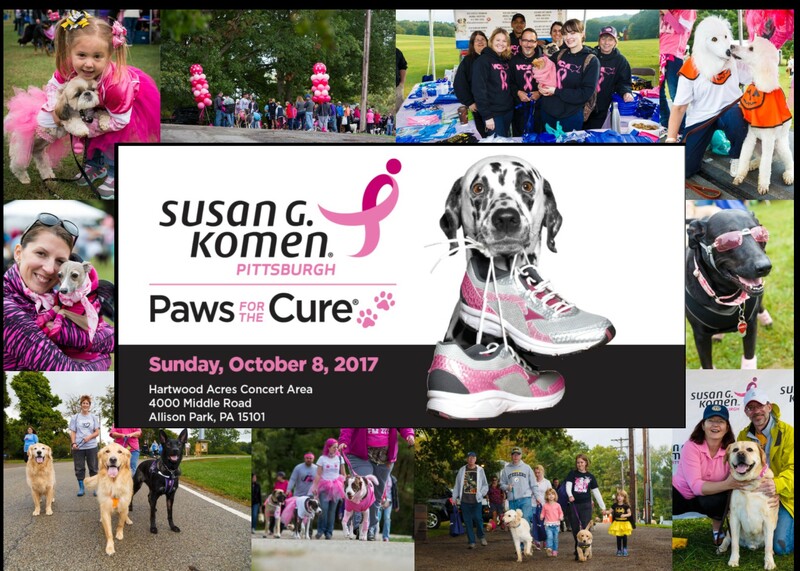 Susan G. Komen Pittsburgh is looking for vendors for our Paws for the Cure dog walk and fall festival. Spots are limited and reserved to one vendor per business. For more information and to request an application, please email Meg at mdluhos@komenpittsburgh.org. 3. guardian at all times. 4. Dog handler must be 18 years or older. 6. have current vaccinations. Dogs must wear an ID tag. 8. and under an adult walker’s control at all times. 9. Owners must clean up after their dogs. We cannot emphasize this enough! 10. No pets in heat. 11. No bicycles, skateboards, or in-line skates permitted. No pullcarts or pet carriages. Upon arrival, please check in at the Paws for the Cure Registration tent. There will be watering stations along the walk route, but be aware if the day is warm and your dog needs water. There will be large crowds and numerous dogs throughout Hartwood Acres; dogs may react differently in these crowded situations. Anyone in violation of these rules will be asked to leave! VOLUNTEERS NEEDED! |  To volunteer, please call Meg or Ben at 412-342-0500.
please contact Meg Dluhos at mdluhos@komenpittsburgh.org or 412-342-0500.